There are Ingham County Parks on Lake Lansing but Lake Lansing-North isn’t one of them. 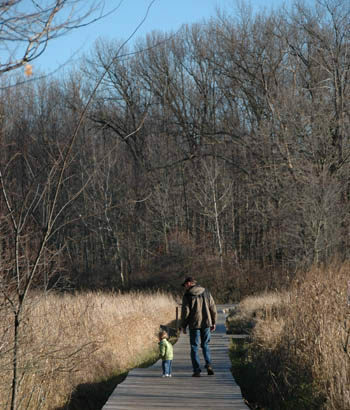 The 410-acre preserve is across the street from the popular lake and features the usual day-use facilities that most parks do; picnic shelters, volleyball and basketball courts, a softball field and two playgrounds. But the vast majority of the park has been left in its natural setting, an intriguing mix of pines, mature oak\maple woodlands and extensive wetlands and marshes, accessed by a 5-mile system of foot paths and boardwalks. Originally known as Pine Lake, Lake Lansing served as a hunting and fishing ground for Indian tribes before the first European settlers arrived in 1836 and built a cabin on the south side, only the second home to be constructed in Ingham County. Later Spiritualists created a park on the west side of the lake as a summer encampment and by the early 1900s Lake Lansing had became a fashionable summer colony. Among those who owned a cottage along it was R.E. Olds, the founder of Oldsmobile. In 1974 Ingham County purchased a shuttered amusement park along the shores of Lake Lansing, sold a historic Denzel carousel to Cedar Point and opened the Lake Lansing - South unit. In 1986, the county purchased the vast wetlands that straddled the Ingham and Clinton County border nearby and opened Lake Lansing - North. 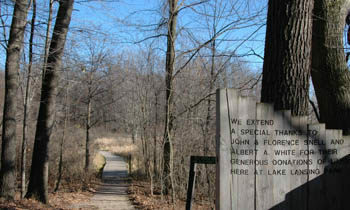 Today the two parks draw more than 400,000 visitors a year of which 90 percent of them are from the Great Lansing Area. 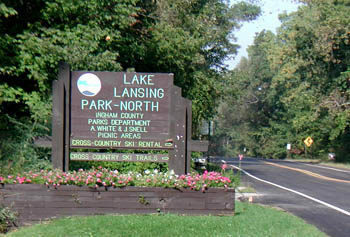 Lake Lansing - North is where trail users head to. The park is best known as a Nordic center in the winter as its trail system is groomed and tracked for cross-country skiing and rental equipment is available. The rest of the year the trails carter solely to hikers as mountain bikes are not allowed in the park. This system is well marked with color posts and location maps, making it easy to hike. The most scenic walk is the Green Trail, a 3.3-mile loop that winds between woods and wetlands and in doing so crosses a dozen boardwalks, some surprisingly long. 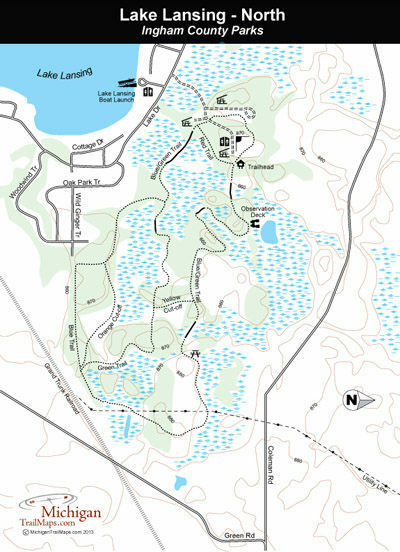 The Blue Trail is the longest loop at 3.8 miles while the first half of the Green Trail and the Yellow Cutoff is a 1.9-mile loop that features a series of well-designed interpretive plaques, making it the best choice for families with young children. No matter which trail you choice or when you arrive, all of them will provide a quiet escape despite being on the fringe of that political beehive known as Lansing. Call the Ingham County Parks Department (517-676-2233) or check its web site (www.ingham.org/PK/Home.htm). For lodging or additional travel information contact the West Michigan Travel Association (616-245-2217; www.WMTA.org).